The recent armed clash between Ethiopian, Kenyan and Somali resistance fighters in the regional strategically city of Mandera has rekindled the long waited regional war of the horn Africa. It is a Somali city located at the cross road between the three countries: Somalia, Ethiopia and Kenya. Mandera was a central meeting point for all Ogadeans before the Scramble for Africa in 1880’s that divide them with artificial boarders. This the time bomb set by colonial powers that divided people of the region by artificial imaginary lines, thus separating families of the same clan. When we talk about the Ogaden region of Ethiopia we have tenancy to forget the name Ogaden given to the region is a tribal name inside Somali populated region of Ethiopia. Today the whole region is named Somali region by the Ethiopian dictator Melese Zenawie since 1991. This is conspiracy against the Somalis by creating a condition similar to Balkans, where there is a country Macedonia and a region with the same name inside Greek. While there is already country called Somalia there is need to create another Somalia. 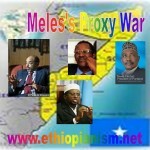 The main purpose to name such ethnical region is to accelerate the dismemberment of Somalia itself. Another point to be raised it is not only in Ethiopia that Ogaden exists, but also in Kenya- the western Somali populated region of Kenya is also inhabited with same tribes of Ogadeni. On the 24th of February the Ethiopian mechanized forces supporting the newly trained Somali mercenaries are fighting the Somali insurgents not far from the border town of Mandera supported with heavy weapons. 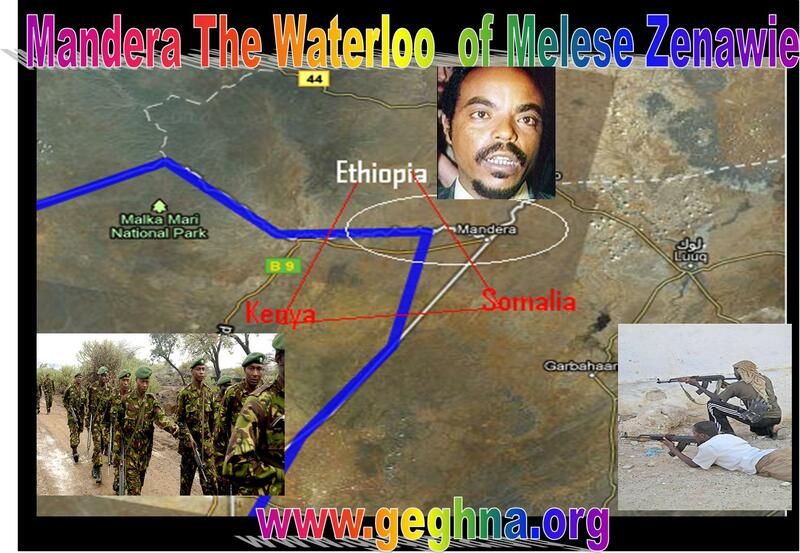 Melese Zenawie government has been involvement in Somali internal affairs since his accession to power in Ethiopia. He had officially started in its invasion of Somali in 2006 which he left after shameful defeat replacing himself with Burundi and Ugandan troops with the umbrella of the African Unity peace keepers. Both countries running UN resolved eternal ethnic rivalry and armed insurgency in their own land. The Melese Zenawie mercenary troops have just been caught in Tripoli and Bengasi supporting the falling killer of Libya and Cyrenaica, Mohammed Gaddafi. The Ethiopian troops are firing missiles to ensure the newly trained Somali mercenary troops are successfully deployed in Somalia to destabilize the already fragile country in the name of fighting “Islam extremism.” It is just a pretext to keep himself in power like Hosni Mubarak of Egypt and Ben Ali of Tunisia. Melese Zenawie is trying to divert the world attention to the newly open conflict on the cross road city of Mandera. The Ethiopian dictatorial regime of Melese Zenawie has been training 2,000 Somali mercenaries since late 2009 to accomplish the unfinished job of Balkanizing Somalia to different factions. Melese has agreed to let Juba land to pass in the hands of Kenya, while unsuccessfully attempted to control Mogadishu. Since the fall of the central state of Somalia in 1989, Somaliland and Putland have already defacto declared their independence. The border fighting for the reparation of Somalia between Kenya and Ethiopia has spilled over to the Kenyan town of Mender last Thursday. The tension was high in Mandera County since Wednesday morning as fears of spill-over of the fighting grip residents of Mandera town. The fist bomb exploded at the Mandera District hospital on Thursday as heavy fighting continued between the different faction to control the border key town between Somalia rebels fighting against Ethiopian troops and their mercenaries with the support of Kenya fighting to control her Ogadeni region of Western territories. Local reporters have seen wounded Kenyans are rushed to be treated for bullet wounds while the authorities are denying their involvement in the conflict to control Somalia. Kenya has increased its contingent by moving an army battalion around Mandera Town. The conflict has reached the Kenyan border towns stretching to Kilima Fisi up to Hulugo Somalia Juba land crossing point near Lamu. These are the intersectional crossing to between the three borderline countries. Beside the regular army Kenya just deployed security team comprising Kenya Army’s Rangers and Special Forces detachments, as well as the General Service Unit and Administration Police. Two severely and four other Kenyan soldiers were also wounded. While Kenya like Ethiopia has trained its Somalis mercenaries, it won’t be long before the conflict spill over to Kenyan Somali region like Ogaden of Ethiopia. “One woman has been reported dead at Border Point One and 10 casualties are being treated at Mandera District Hospital,” Kenya Red Cross Secretary General Abbas Gullet said in a statement. He said the fighting that started at about 10am on Friday did not spare the Red Cross offices where several gun shots were fired, but no casualty was reported. “Several gunshots flying in the air across the border have hit the Kenya Red Cross Society (KRCS) offices in Mandera, where six members of staff are holed up, like many other residents of Mandera town,” Mr Gullet said. “The gunshots have rocked the town, keeping residents and refugees indoors,” he said. The Society’s Spokesman Titus Mung’ou said the situation had put the lives of humanitarian workers and other residents of Mandera town in grave danger. “We have reported this latest incident to the Government and hope the KRCS offices, which have a Red Cross emblem flag hoisted on the rooftop, will be protected,” he said. The Red Cross emblem is a protected symbol, under the Geneva Conventions, and all warring parties are required to respect it, he added. “Hundreds of refugees are now scattered on the Kenyan side of the border, as it is risky to gather in camps until fighting ceases,” he said. Hundreds of families began fleeing Mandera town Friday following the intense fighting that has been going on at the Kenya-Somalia border since Wednesday. Reports from Mandera indicate that schools, government offices and hospitals had been shut for stray ammunition that has been hammering the border town. On Thursday morning, eight people were struck by bullets fired by militia men who have been fighting AU troops on the Somalia side. “It is scaring, you cannot know when a bullet will land near you and that is why people are running for safety,” the councilor who only identified himself as Ahmed said. “Some houses have gone up in flames since morning and we don’t know who are burning them but we highly suspect it has something to do with what is going on at the border,” Ahmed added. He said Mandera town remained deserted for the better part of Friday and only military and police trucks were seen parked strategically with heavily armed officers. “People are running towards remote areas far away from Mandera, we don’t want to become victims,” he added “This place now is inhabitable, there are heavy gunfire renting the air every after a couple of hours. The situation was made worse when a bomb was hurled at the Mandera district hospital but no one was hurt because it landed on an open field. “The hospital covers a large area, we are lucky it landed on an open ground, it could have been disastrous,” ole Serian said on telephone from where he was coordinating security. Some 14 African Union soldiers flown from Mogadishu were still admitted to hospitals in Mombasa where they have been receiving treatment for bullet wounds since Thursday. Military Spokesman Bogita Ongeri told Capital News they had enhanced security at the border towns to stop Al-Shabaab fighters from liberating from controlling western Kenya. The Kenyan soldiers fought the Somali resistance fighters who had tried to stop them from controlling the Somali region of Kenya seven were injured. The best and the lasting solution for the region is non ignorance in the internal affair of Somalis by the different neighboring counties like Ethiopia and Kenya in order not further radicalize the situation. The strategic city of Mandera would be the Waterloo of Melese Zenawie and the Kenyan election killers who are trying to divert the internal situation to this undue conflict by calling for intervention the embattled western forces in Iraq and Afghanistan. Proxy Warriors of of the Horn of Africa battling with words at the UN to win allies ? Muse Tegegne, Prof. The month of September is a special month in the history of the Horn of Africa. It is the month of Ethiopian & Eritrean Orthodox New Year falling the same day as that of 9/11 terrorist attack 9 years ago in New York. The 1st of September is a memorial day in Eritrea, the day the struggle of liberation started. This day is commemorated every years in Asmara the capital of the ex Italian colony once federated later province of Ethiopia, which seceded in 1991 and became Independence in 1993, with the full support of the present regime of Ethiopia. Eritrea is a pure creation of the scramble for Africa. The Eritrean legacy of colonization has continued to this day starting a full flagged war with Ethiopia 7 years after its independence. The leaders of Eritrea and Ethiopia were once comrades in struggle against the Marxist regime of Addis Ababa, today they are at least publically sworn enemy. The war exploded in 1998 between the two frères-enemies up until 2002, when Cessez-le-feu was established by the intervention of the UN , costing over 200000 lives. Further more, the two dictatorial regimes continue their proxy war and war of words by organizing proxy armed movements in each other soil. They even further destabilized the region by employing their proxies in Somalia. Thus, Somalia became the center of international terrorism and piracy sponsored by Al Qaida. The Ethiopian dictator dragged in over 5000 African forces to Somalia after unsuccessful occupation of the country for two years starting 2006. In 2009 Ethiopian regime pressured the AU at its siege in Ethiopia to impose sanction against Eritrea by the UN. Eritrea in return continues supporting the opposition groups in Somali and Ethiopia in spite of the UN sanction to this day. Eritrea called the sanction as”ludicrous punitive measures” and warned that their imposition risked “engulfing the region in to another cycle of conflict as it may encourage Ethiopia to contemplate reckless military adventures”. When we talk about security in the Horn of Africa Region…we cannot avoid raising our concern once again about the destructive role the Government of Eritrea has continued to play since independence. It is an open secret that the Eritrean Government has for some time now been actively playing the role of the spoiler in the whole tragic situation in Somalia…the Eritrean regime is the principal destabilizer in our sub-region with utter contempt for international law and the norms of international behavior. Their accusation and counter accusation has been a daily phenomenon since 1998. The truth would be both to stop preparing proxy warriors and comply with the UN resolutions. The most dangerous are those caught with trends of Somalian Syndrome N° 3 and N°4″. Somali President Urges International Help to Fight Terrorism . Is Eritrea becoming a destabilising force? Somalia the Kurdistan of Africa was known as Puntland prehistorically by the ancient Egypt. Since the Scramble of Africa the Somalis have gone through war and unprecedented conflict. The Somalis are found today in Kenya, Ethiopia, Djibouti, Puntland, Somaliland and Somalia. In the post colonial period the Somalis have been victim of extremism and continue foreign intervention: – the US in 94/95, Ethiopia 2006, and recently they become the center of conflict piracy and instability in the horn of Africa. Most importantly they have been the battle ground for Eritrean and Ethiopian Proxy wars which engulfed the countries of the Great Lakes Uganda and Burundi under sponsored by AU. A transitional Government has been established under the auspices of the AU and the UN. The recent rift between the two top leader of the embattled Somalia is about to collapse mostly from the weakness and the ambivalent engagement of the AU troops. Thirdly by non commitment of the AU member countries to give unconditional support to TGS, and those engaged are half heartedly employed as means to boom the position of the supporting countries strong men’s international stand rather than resolving the Somalian Question Definitively. All these factors are working indirectly for Al Shabab’s advancement. The continuous polemic between the two will collapse the AU supported TGS if not resolved internally. TGS could not be able to control outside the President’s office residence and the Air port which was targeted by the suicide bombers of Al Shabab few days earlier. The Resent Al Shabab’s bomb blast at Muna Hotel killed some member of TGS parliament sending shock waves to the AMSOM troops lamenting in Mogadishu. The recent Al-Shabab attack forced the Ugandan president to send additional troops to help the government in its last battle against Al-Shabab. The 6000 strong AU peace keeping force did not succeed to subdue the supposedly Al Qaida supported Somalian street fighters. They are indirectly supported by the government of the Red Sea costs who opposes the Ethiopian and AU supported TGS forces on the ground. Red Sea governments like Yemen, Eritrea and Egypt opposes the definitive secession Somaliland. The newly elected Islamic Unity party is highly advised to take over Mogadishu by these governments which see their interest compromised. The newly independent Somaliland on the Cost of the Red sea serving as an Ethiopian out let than that of the Traditional Djibouti and Eritrea will weaken their economic and geostrategic interest in long term if the port of Barbara becomes the principal port in the Indian Ocean for the Ethiopian and the newly independent Southern Sudan outlet. The continues division between the two top leaders will precipitate the end of the TGS as we know it, and will be bring a new change breaking the status quo. The TGS Premier seemingly has assured the support of the Parliament and some countries around the region against President Sharif. UN wants transitional government to end squabbling as it warns about insurgents becoming a serious security threat. The United Nations has warned that Somalia insurgents are posing a serious international security threat and made a renewed appeal to the transitional government to end the civil conflict. The rise of the al-Shabaab movement has raised concerns among western governments, in addition to the pirates operating out of Somalia ports. Somalia will be in the spotlight during a debate at the Security Council on Thursday and a top level ministerial meeting on the conflict at the UN General Assembly summit next week. Ban Ki-moon, the UN secretary-general, said “horrific” suicide bomb attacks by al-Shabaab followers in Uganda in July had shown the growing threat from the al-Qaeda inspired group. Some 76 people were killed in that attack. “The attacks demonstrated that al-Shabaab remains a serious security threat for Somalia, the sub-region and the wider international community,” Ban said in a report to the Security Council on Monday. The UN report said the Somali capital’s “already weak health services are struggling to cope with casualties”, citing thousands of reported deaths in Mogadishu this year. A special envoy for Ban, Augustine Mahiga, an African Union envoy, Boubacar Diarra, and an East African peace envoy, Kipruto Arap Kirwa, were at Mogadishu airport on Thursday to meet Sharif Sheikh Ahmed, the head of the transitional government, when a suicide bomber killed five people there. The three envoys said on Monday the government is in disarray and warned that the divisions were “potentially very damaging” to efforts to end the chaos. The transitional government is scheduled to end in August 2011, and analysts say it has achieved little so far. Repeated political battles in recent months have seen the president dissolve the cabinet and the parliament speaker resign. “Somali forces and [AMISOM troops] risk their lives each day to protect the transitional federation institutions and defend the integrity of the peace process,” the three envoys said in a statement released in Nairobi. Ban sent a similar message highlighting international efforts to promote peace in spite of the “internal disputes” and “political complications”. The UN chief said the international financial crisis has hit efforts to boost the African peacekeeping force. “I remind all parties to the conflict that those found responsible for war crimes will face justice,” Ban said. The June election in Somaliland is victory to democracy in the horn of Africa compared to the recent election in Ethiopia, Sudan & Burundi. The National Electoral Commission (NEC) declared Kulmiye (Unity) party the winner. Kulmiye party received 49.6% of the vote, while the party of president Dahir Rayale Kahin (UDUB party), managed just 33.1 per cent Second opposition party, UCID (Justice and Welfare party) finished third scoring 17.2 per cent of the vote. The international community want to see change that might bring more respect and democracy in the region. The Final result announced Kulimye: 266906 | 49.6% ,UDUB: 178881 | 33.1% UCID: 92439 | 17.2% . Kulmiye leaders known for their Pansomlaian ideology will show more and more unification tendacies and their cross board relation with the Islamists. The June 26, 2010, Presidential elections results was hold to the July 1 2010 by creating collusion to the Somalian independent and unification date in July 1st, 1960. This will compromise the the long waited international recognition of Somaliland as an independent state. Somaliland a former British colony tacked on to Somalia when the latter gained independence from Italy in 1960,and jioned Somlia Itlaian till It broke away from Somalia in 1991, after the overthrow of Siad Barre. Egypt and Eritrea has been suspected as being a sponsors of the Kulmiye victory in Hagessa and Iran not far away. They are will push for Somaliland to tighten controls on international trade, through Berbera, to sustain landlocked Ethiopia. It seems in very near future the Kulmiye and al-Shabaab leadership will push to take over control of the Government of Somalia which will put Somaliland to the confusion of of Somalian Syndrome. President-elect Ahmed Mohamed Silaanyo paid a surprise visit to the outgoing President Dahir Riyale Kahin in his office on Sunday morning. The two also forgave each others for what each said to the other over the years. Mr Riyale who took office in May 2002, after the death of Mohammed Haji Ibrahim Egal, will be remembered for bringing stability to Somaliland and strengthening democracy in the country despite the many election delays. The Election Commission of the Republic of Somaliland on July 1, 2010 — as noted, the highly-iconic 50th anniversary date of the original union of the Republic of Somaliland with the former Italian Somaliland to create the Union of Somalia — announced that the pan-Somalist, radical Islamist Kulmiye party candidate, Ahmed Mohamed Silanyo, had won the June 26, 2010, Presidential elections. Kulmiye — with major support from a broadly-based network of Islamists throughout the region, a range of pan-Somalists and southern Somalian clans, several regional governments, and at least one major Western front organization — prepared a broad campaign for which the UDUP Government under Pres. Dahir Riyale Kahin, although fully warned, were totally unprepared. Kulmiye had stage-managed significant elements of the Election Commission, and the media, and had prepared a round of post-election back-up plans which included adding prepared, loaded ballot boxes, and a campaign of street protests in the event that it looked as though all other steps failed and in the event that the Government had, in fact, taken strong pre-emptive steps to curtail Kulmiye’s creative electioneering. Kulmiye leaders and other pan-Somalists and Islamists with who they were working had been noting that July 1, 2010, would be the symbolic date of the beginning of the reunification of the two Somalilands. That the Election Commission, which had been strongly influenced by payments from foreign sources (as GIS/Defense & Foreign Affairs had noted earlier), withheld announcement of the results of the June 26, 2010, Presidential elections until the iconic date of July 1, as if confirming the reports of collusion with the pan-Somalists. The ramifications of the event will gradually become apparent, quite apart from short-term impact on Somaliland’s hitherto stable society. Domestically, shari’a law will become dominant, and cooperation with jihadist groups, such as al-Shabaab, will become routine. Somaliland, for even as long as it continues to exist as an entity, will cease meaningful cooperation with the West on counter-terrorism and counter-piracy issues. The key sponsors of the Kulmiye take-over, particularly Egypt and Eritrea, and possibly Iran, will push for Somaliland to tighten controls on international trade, through Berbera, to sustain landlocked Ethiopia. Clearly, the Kulmiye and al-Shabaab leadership will also push to take over control of the Government of Somalia, such as it is, within any new de facto or de jure reunion of the two Somalilands. One very direct result will be to add pressure on the Meles Zenawi Government in Ethiopia, forcing it to rely more, once again, on Djibouti as the entrepot for Ethiopian trade. This will add significantly to Ethiopia’s costs, given Djibouti’s history of exploiting its position in this trade in the past. This accords with Egypt’s wishes to weaken Ethiopia, which controls the headwaters of the Blue Nile, the major source of water for Egypt. Egypt’s position of hostility to upstream riparian states on the Blue and White Niles, and Egypt’s refusal, this year, to come to an agreement on Nile water usage with other riparian states. Egypt’s challenge to Ethiopia, as the principal water source for the Nile, may, however trigger a backlash, and actually cause Ethiopia to attempt to dam or divert Nile waters for energy and agricultural purposes, literally leading to a reduction in flow to Sudan and Egypt. The Egyptian Government has noted in the past that any attempts to deny Egypt the water to which it feels it has a legal right — in contradistinction to inter-state legal precedent on the topic — would represent casus belli: cause for war. The Egyptian Government has put interference with Nile waters ahead of any other possible cause for war. Eritrea, meanwhile, still harbors hopes that Ethiopia would be forced to an accommodation with Eritrea to use the ports which Eritrea assumed from Ethiopia when Eritrean independence was willingly given by Addis Ababa — at the express command of Prime Minister Meles — in 1993. This is, perhaps, still the major point of contention which Ethiopians have against Prime Minister Meles: not just that he gave Eritrea, historically always a part of the Ethiopian Empire, its independence, but that he included in that “give away” before he even became an elected head-of-government coastal areas and ports of Ethiopia which had never been part of the Eritrean province. That move left Ethiopia land-locked and dependent on Eritrea for port access, a move which Eritrea exploited so ruthlessly — demanding that Ethiopia receive untradeable Eritrean currency for all of its exports — that a break in relations came, precipitating the Ethiopian-Eritrean wars. Ethiopia subsequently developed port access through Djibouti, and then Berbera. Thus the collapse of the alliance with Somaliland, as a result of the July 1, 2010, announcement of a new President there, is of profound concern for Addis Ababa. The Pan-Somalists and al-Shabaab and others involved in the change in Somaliland are themselves openly and strenuously hostile to Ethiopia, which had militarily supported the Somaliland Government and had also put troops into Somalia — including into the Somalian capital (and former capital of Italian Somaliland), Mogadishu, to fight the Islamists, including al-Shabaab. It is highly significant that the Italian Government had supported the pan-Somalists based on historical feelings of identity with the onetime Italian Somaliland, despite the reality that this has contributed significantly to the continued instability in the Horn. Similarly, the Italian Government has sustained its profound support for Eritrea against Ethiopia, once again because of “historical solidarity” with Eritrea, which it had briefly colonized, before being defeated on two occasions in Ethiopia (1893, at the Battle of Adwa, the most significant defeat of a Western power in Africa; and in 1941). What is significant is that the Italian Government has gained nothing of strategic value for this emotional attachment, but has contributed significantly to the instability of the Horn of Africa. It is now possible that the Eritrea-Ethiopia relations will undergo a further increase in tensions. Eritrea put in substantial guerilla forces, and support for dissidents in Ethiopia, in the run-up to the June parliamentary elections which returned Prime Minister Meles’ coalition to power. It would be unsurprising if direct hostilities broke out again between Ethiopia and Eritrea within a year. Indeed, this may be the key to Eritrean Pres. Isayas Afewerke retaining power in his state, despite the continuing decline in the state’s economic fortunes and the increasing repression in his state. Significantly, the transforming situation marked by the July 1, 2010, collapse of Somaliland’s moderate, pro-Western Government will be to ensure greater access by international jihadist and terrorist groups to the Horn of Africa; greater difficulty for external states to influence and reduce the incidence of piracy in the Red Sea and Indian Ocean regions around the Horn; a greater ability for groups supported by Iran to support cross Bab el-Mandeb operations against the Yemeni Government (and supporting anti-Sana’a forces based in the former South Yemen regions); as well as stimulating the prospect for Eritrean-Ethiopian conflict and possibly initiating Ethiopian-Egyptian military tensions. Overall, the move to topple the moderate Government in Hargeisa, the Somaliland capital, provides a safe-haven for a wide range of activities by Islamists, jihadists, and other non-governmental actors from bases in the Horn. These will play into hostilities within the Arabian Peninsula as a whole, and will interact, almost certainly, with anti-state players in Pakistan. In all of this, Iran has historically played a key rôle in Somalia, and this will expand. By Spring 2010, Tehran and its allies were increasingly worried about their strategic posture at the Red Sea as a result of the growing militant-separatist sentiments in southern Sudan. The likely outbreak of a civil war in Sudan would deprive Iran and jihadists the use of Sudan’s Red Sea ports as the base from which to block the Red Sea in case of a major confrontation with the US. The series of Israeli clandestine, air, and naval strikes against convoys and ships in northern Sudan carrying weaponry to the HAMAS in Gaza (to be delivered via Egypt and the Sinai) only added to the Iranian sense of vulnerability. In mid-April 2010, Sudan held the first ostensibly free elections in 24 years. According to the official results, President Omar al-Bashir and his ruling National Congress Party (NCP) won 68.24 percent of the votes. Far more significant, however, was the election of Salva Kiir Mayardit with an overwhelming majority of 92.99 percent to the post of both the First Vice President of the Republic of Sudan and the post of president of Sudan’s southern region. Kiir was the candidate of the Sudan People’s Liberation Movement (SPLM) which advocates the secession of the south in order to establish an independent state in the upcoming referendum now scheduled for January 2011. The referendum is the final step in the implementation of the January 2005 Comprehensive Peace Agreement (CPA) between the SPLM and Khartoum. However, Khartoum has already vowed to prevent the dismemberment of Sudan — particularly given the vast oil reserves in the south (particularly the disputed Abyei region) — and already manipulated the 2008 census results to reduce the number of eligible black voters in the south and bloat the number of Arab voters in the north. This created growing tension and fear of the resumption of the vicious civil war. Indeed, starting 2008, the SPLM began using oil revenues in order to purchase heavy weapons — including tanks, artillery and rockets — in the former Soviet Union and ship them, via Kenyan ports, to Sudan in preparation for the anticipated resumption of fighting. The extent of the procurement efforts of the Sudanese People’s Liberation Army (SPLA) was revealed in September when Somali pirates working for Sudanese intelligence hijacked a Ukrainian cargo ship carrying 33 T-72 tanks and crates of small arms. The ship later released after Kiev showed proper end-user documents identifying Kenya as the owner of the weapons and the pirates received a $3.2-million ransom. The flow of weapons has markedly intensified since Spring 2009. Some of these weapons were already used in the pre-election clashes in March 2010. 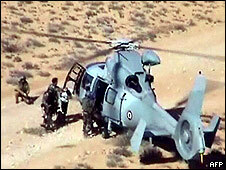 In early Summer 2010, the SPLA drafted plans to train pilots and acquire combat aircraft and helicopters. “We want to transform SPLA from a guerilla force into a veritable military,” SPLA spokesman Maj.-Gen. Dame Koala said. Khartoum immediately warned that the establishment of an air force or navy in the south would violate the CPA. But SPLM leaders reiterated their commitment to establishing a proper military using oil revenues. In May 2010, SPLM Secretary General Pagan Amum warned in an interview with the Saudi-owned Al-Sharq al-Awsat that the establishment of an Islamic Republic in Sudan, as advocated by Bashir in the aftermath of the April elections, would lead to the break-up of the country. “If the National Congress Party insists on implementing a program for building the Islamic Republic then southerners will have no choice but to vote for secession. If the National Congress Party insists on imposing its policies of oppression and racial discrimination then southerners must secede, and if the National Congress Party continues to plunder the wealth of the south and unjustly divide oil revenues in the absence of transparency, then southerners will have to break free from those tyrants,” Amum warned. In early June 2010, Amum raised the ante in another interview with Al-Sharq al-Awsat in which he asserted that unification was unlikely under current conditions. “In the shadow of the National Economic Salvation regime, and its Islamic project, there is no solution, or even a drop of hope or Sudanese unity. … There is no possibility or even the slightest chance to achieve Sudanese unity unless the NCP reoccupied the South and takes control of it through military force. This would be a bloody step, and this would not represent unification but occupation.” Amum confirmed that Kiir is actively preparing to form a government of the South in their capital Juba. All the best SPLM cadres were transferred to Juba and only expandable SPLM officials were sent to fill CPA-mandated positions in the Khartoum Government. As is the case of Somaliland, Egypt and Eritrea lead calls for the southern Sudanese referendum on self-determination to be postponed. 7. Increased activities by Eritrean-backed terrorist and guerilla activities inside Ethiopia, possibly with the revived support of Libyan Pres. Mu’ammar al-Qadhafi and Egypt. The interactive result of all of this, including the Sudanese developments, will be to increase the dangers to shipping in the Red Sea/Suez SLOC, and compound threats to Yemen and Saudi Arabia, at the very least. This contributes significantly to Iran’s strategy to weaken Saudi Arabia’s influence. Ironically, many of the jihadist/Islamist activities in the Horn have been ostensibly Wahabbist/neo-salafist in nature, deriving from the State-sponsored Saudi sect of Sunni Islam, which have — as with Osama bin Laden’s proselytization — been used against the Saudi State and interests. Ironically, early recognition of the sovereignty of the Republic of Somaliland when it broke away — as it had every legal right to do — from the ill-fated union with Somalia in 1990 would have prevented this situation, and would have helped stabilize the Horn of Africa long before this time. Egypt, the Arab League, and Saudi Arabia worked hard to prevent this recognition, but the African Union (AU), and the major trading powers with a vital interest in the Red Sea, could have unilaterally recognized Somaliland. The absolutely spurious claim that Somaliland could not be recognized because it was a “breakaway” state from Somalia should have been recognized for what it was: legally nonsensical. Somaliland was fully independent and sovereign from the United Kingdom — its earlier colonial overlord — before it joined into the union with Italian Somaliland. To say that Somaliland could not withdraw, and be recognized, from that union in 1990 would be tantamount to saying that Egypt could no longer be recognized as independent when it withdrew from its “United Arab Republic” experiment with Syria. The outgoing Government of Somaliland was warned, privately, of the moves being made to overthrow it by using the occasion of the Presidential election to stage what amounts to a coup de manœuvre, and yet proved incapable of addressing the threat. GIS/Defense & Foreign Affairs also publicly identified the process through 2010. And yet no-one acted, other than the extremists and their Western supporters who may well have been promised resource concessions in the region as payment for their support. Somalia divides the West :- Who control the ground and high seas ? German lawmakers have voiced concern about a deal between a German military security firm and a warlord hostile to the UN-backed government in Somalia. Asgaard German Security Group, which hires former German troops, has signed a contract with Abdinur Ahmed Darman, who claims to be the Somali president. MPs from three German parties said the deal would aggravate the conflict in Somalia and violate UN sanctions. But a BBC reporter in Somalia says Mr Darman is a marginal figure in the war. Mr Darman declared himself president in 2003, but has not lived in the country for about five years, and is regarded by most Somalis as a publicity seeker, the BBC’s Mohamed Moalimuu reports from the capital Mogadishu. Asgaard says it will provide services, including military training, only when Mr Darman becomes the country’s leader. Mr Darman’s Republican Party has an office in Mogadishu and occasionally issues statements – referring to Mr Darman as president – but is not considered a major political player. “As soon as he assumes control of state affairs again, with the approval of the UN, Asgaard GSG will take charge of training, equipping and supplying the fire service, public health service and disaster control, as well as the police and military,” a statement on Asgaard’s website said. Somalia has been racked by violence for more than two decades. A leading German MP in the left-wing Linke party, Paul Schaefer, said Asgaard’s deal was worrying “because it’s a kind of shadow foreign policy, beyond parliamentary control”. A German liberal FDP politician, Rainer Stinner, said such a deal “clearly violates” UN sanctions prohibiting arms deliveries or training for Somali militias. Islamist groups control much of the south of the country, with the UN-backed transitional government headed by President Sheikh Sharif Sheikh Ahmed limited to small parts of the capital. President Ahmed – a former insurgent leader who was elected by Somali MPs in January 2009 – is in Turkey for a peace conference, where he told the BBC how he intended to tackle the Islamists. He said he wanted to build up a government army while offering an olive branch to radicals who might be turned. But the BBC’s Mark Doyle in Istanbul says it is far from clear if the president, described in the West as a moderate, will prevail. Western support is a poisoned chalice in nationalist Somalia, he says. (CNN) — A U.S. destroyer is shadowing a ship off the coast of Somalia after it was taken over by 50 pirates, authorities said. The M/V Iceberg was identified last week after the USS McFaul conducted a 36-hour surveillance mission, the multi-national Combined Maritime Forces said in a statement. The USS McFaul began shadowing the Panamanian-flagged vessel May 19 before the M/V Iceberg reversed course and began heading toward the Somali coast. “We cannot be sure what the pirates’ plan was if they had not been interrupted,” said Rear Adm. Beom Rim Lee, commander of the Combined Maritime Forces task force. The destroyer USS McFaul is monitoring a Panamanian-flagged vessel taken over by pirates. “The vessel may have been on its way to either assist other pirates in distress, or look for another merchant vessel to attack,” he said. The M/V Iceberg was last been seen off the coast of the Somali town of Garacaad, a known pirate haven, but its exact location was unknown until USS McFaul positively identified it. “Further investigation showed the name of the ship had been crudely painted over” in an effort to disguise it, which caused confusion in identifying it, the Combined Maritime Forces statement said. 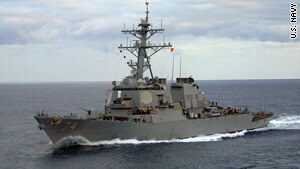 The USS McFaul had initially requested to board the ship to check on the crew. The M/V Iceberg denied it had been taken over, saying it was having mechanical difficulties. Eventually, crew members radioed back saying they had been taken hostage by heavily armed pirates, officials said. The M/V Iceberg has a crew of 24 from Yemen, India, Ghana, Sudan, Pakistan and the Philippines, officials said. Cmdr. Ronald W. Toland, Jr., commanding officer of USS McFaul, said he tried to ensure the safety of the crew first. “Given the report of heavily armed pirates on board, it was more prudent to monitor the ship’s movement, rather than attempt a rescue,” he said. ADDIS ABABA (Somalilandpress) — The president of Somalia’s semi-autonomous region of Puntland, Mr. Abdirahman Mohamed Farole has recently held a meeting with Ethiopian Foreign Affairs Minister, Seyoum Mesfin in Addis Ababa. The meeting which took place in Sheraton hotel, focused on number of issues including regional security as well as the Puntland cabinet ministers. According to a sources close to Mr. Farole, the Ethiopian government disapproved Mr. Farole’s presidential decree, dated March 12th, ordering the dismissal of Puntland Intelligence Service (PIS) director, Mr. Osman Diana (see SOMALIA: Puntland President Dashes to Ethiopia For an Emergency Meeting). The PIS is said to receive at least 50 per cent of Puntland’s annual income as well as funds from Western and Ethiopian intelligence services. While the two were discussing the issue, the Ethiopian Foreign Affairs Minister, Mr. Mesfin, has expressed concern about a number ministers and provincial officials in the Puntland government accusing them of having ties with extremists in southern Somalia. Mr. Mesfin, accused Puntland’s national planning minister, Mr. Daud Mohamed Omar and number of others including the governor of Bari region, Sheikh Abdihafid Ali Yusuf, the Mayor of Garowe (capital of Puntland), Mr. Abdiaziz Nur Elmi Koor, mayor of Bossaso town, Mr. Mohamud Farah Beldaje and the mayor of Galkayo, Mr Abdirahman Mohamud Haji Hassan of having ties with Somalia’s Islamists rebels fighting the TFG in southern Somalia. United States House of Representatives Committee on Forgeign Affairs invites Somaliland. The Subcommittee on Africa and Global Health chair by Congressman Donald M. Payne has invited Somaliland’s Foreign Minister his excellency Abdillahi Mohamed Dualeh, along with Puntland President Dr. Abdirahman Farole, Dr. Crispus Kiyonga Minster of Defense from Uganda and Somali’s Foreign Minister Mohamed Omar. These leaders were invited to attend an open briefing and hearing of the Subcommittee on Africa and Global Health with regards to Somalia’s prospects for lasting peace and a unified response to extremism and terrorism. 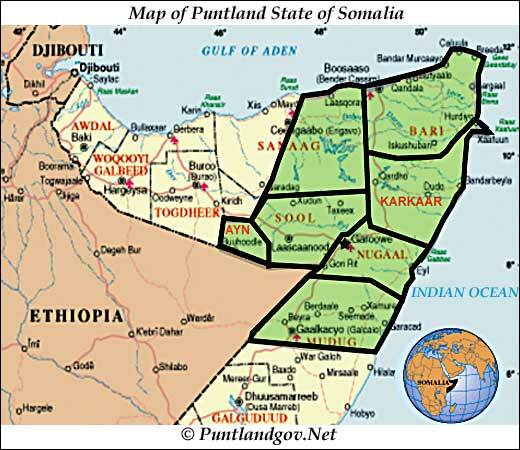 The northeast region of Somalia has, since mid-1998, been referred to as the Puntland State of Somalia . Although pre-colonial Somalian society did not have a national government with modern structures and clearly defined international borders, the northeast region had traditional structures of government dating from the early years of the 19 th century; namely, the Sultanate of Majerteen (1901–1927), whose territory included the current regions of Bari and Nugal, the Sultanate of Mudug/Hobyo (1885–1925) and the Sultanate of eastern Sanaag (1896–1925). These Sultanates were relatively under-developed and far from achieving a modern status in terms of political and state management systems. They had administrative and military structures, which safeguarded security, social welfare and political stability until these were disrupted by colonial powers; the Italians in the first two Sultanates and the British in the third one. Trade and commercial relations existed between the Sultanates and the Indian sub-continent and Arabian Gulf states. For instance, ad valorem taxation systems, export of livestock, animal and agro-forestry products and import of consumer goods thrived in the Sultanate of Majerteen during the second half of the 19 th century and first quarter of the 20 th century. The Italian and British conquest of the Sultanate in (1923-1927) suppressed the peoples’ resistance and destroyed all political, economic and commercial structures. The Italian fascist authorities were more repressive than the British, as reflected by the economic policies they applied to these regions. For instance, import-export trade and all the commercial transactions with above mentioned traditional markets were suspended and forcibly replaced with Italian trade companies, which imported consumer goods from Italy and exported salt, frankincense, hides, skin and agricultural cash crops (banana and cotton) to Italy through Mogadishu. The suspension of trade markets and political structures of the former Sultanates by the colonial authorities had a devastating effect on the livelihood security, famine coping mechanism and employment/income earning opportunities of the northeastern communities. Pastoralists, merchants and fishermen had to immigrate to the southern regions in order to seek employment and trading opportunities. Furthermore, the Sultans of Majerteen and Mudug, their families, relations and key collaborators, such as the traditional elders, were forcibly deported by the Italians to Mogadishu . Bartamaha (Nairobi):- Somali pirates have seized a Kenyan-flagged fishing vessel, the European Union Naval Force said Tuesday. Cmdr. John Harbour said Tuesday the Sakoba was taken last week, but many details remain unclear. The owner has not been in touch and the ship was not registered with maritime authorities. The crew nationalities and numbers are unknown. Pirate attacks usually peak in March and April when the seas are calmer and the past week has seen a flurry of attacks and shoot-outs between pirates and security forces. It is very unusual for a ship owner not to report a hijacked vessel to naval authorities. Naval authorities say there has been no communication with the crew. However, Harbour said that armed pirates have been sighted onboard. The Sakoba was last registered in Spain three years ago but the Spanish Environment Ministry, which handles maritime affairs, said the vessel is Kenyan-owned. The ship was apparently taken about 400 miles (640 kilometers) east of the Tanzanian city of Dar Salaam last Wednesday, Harbour said. Somali pirates have been extending their reach south into the Indian Ocean because of stepped up naval patrols in the Gulf of Aden. Harbour said the pirates may use the hijacked vessel as a ‘mothership’ to carry extra food, fuel and water and tow pirate speedboats hundreds of miles out to sea. The Sakoba is following the path of another hijacked ship, a Norwegian chemical tanker, which was seized on Friday near Madagascar. Both vessels appeared to be headed for the pirate stronghold of Haradheere, he said. The failed state of Somalia provides the perfect haven for pirates, which prey on the busy shipping lanes nearby. The Somali government is fighting an Islamist insurgency and cannot take on the well-armed, well-paid pirate gangs as well. Ransoms are typically several million dollars _ a fortune in a war-ravaged country where nearly half the population is dependent on aid. BOSSASO, Somalia June 14, 2009 – A Cabinet minister in Somaila’s self-governing State of Puntland returned home Saturday from Ethiopia with a delegation led by the Puntland Vice President, Radio Garowe reports. Mr. Farah Aden Dhala, Puntland’s Planning and International Cooperation Minister, spoke with community-based Radio Garowe via telephone after returning to Bossaso, the region’s commercial hub. “Our trip to Ethiopia was a follow-up of the President’s visit in March,” Minister Dhala said, adding that discussions with Ethiopian government officials in Addis Ababa ranged from security to trade relations. According to the Planning Minister, Puntland and Ethiopian officials discussed the possible opening of an Ethiopian Trade Office in Garowe, the capital of Puntland State, which would help facilitate travel and trade relations between the two sides. Further, the discussions covered ways of establishing airline relations of direct flights between Addis Ababa and Bossaso in order to help improve commerce and strengthen trade ties. “Our delegation also met with Ambassadors from several countries, including Sweden and Germany, while in Addis Ababa” Planning Minister Dhala said, adding that discussions covered anti-piracy efforts. Lastly, the Planning Minister said that Ethiopian government officials want to play a “neutral role” in the conflict between Puntland and Somaliland. “We expressed Puntland’s policy of retaking Las Anod and Ethiopian officials said they want Puntland and Somaliland to coexist peacefully,” Mr. Dhala added. Las Anod, the capital of Sool region, has been at the heart of the Somaliland-Puntland conflict since Dec. 2002 when Puntland security forces took control of the provincial capital. 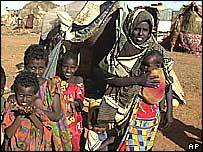 In Oct. 2007, Somaliland troops took control of Las Anod after fierce battles forced upwards of 50,000 civilians to flee. Both Planning Minister Dhala and Puntland VP Gen. Abdisamad Ali Shire hail from Sool region, which is dominated by members of the Dhulbahante sub-clan within the larger Darod clan-family. MOGADISHU, March 11 (Xinhua) — At least 30 people were killed and almost 83 others were wounded Thursday as the fierce fighting continues between Somali government forces backed by African Union (AU) peacekeeping troops and Islamist insurgent fighters in Mogadishu, medical sources said. The fighting which erupted on Wednesday resumed in the early hours of Thursday morning after it briefly stopped overnight with both sides claiming successes. “As many as 30 people were killed, 12 of them in one area in the north of Mogadishu while we have picked almost 83 wounded people including 35 children mainly in the northern districts of Mogadishu,” Ali Muse, head of local ambulance service told Xinhua. Heavy artillery and intense gunfire was heard around the battle areas in the north of Mogadishu where witnesses said several shells landed in residential neighborhoods. Families in residential pockets in the north began fleeing their homes to join hundreds of thousands of displaced civilians on the outskirts of coastal Indian Ocean city of Mogadishu. Somali government military commanders as well as insurgent fighters have claimed to have achieved ground from the other side but that cannot be independently verified as the battle still rages in north Mogadishu. The latest upsurge in fighting comes as speculation intensifies of a major government offensive to retake the capital from rebels who control more than half of the restive coastal city. Somali government controls only parts of the capital Mogadishu while Islamist groups rein over large swathes of territory in the south and centre of war-ravaged horn of African nation. The U.S. pledged to support Somali government plans to wrestle control of Mogadishu from Islamists who are poised to oust the weak but internationally recognized government of Somalia. MOGADISHU, Somalia — Fighting erupted in Somalia’s capital for the third straight day Friday in some of the worst violence in nearly a year, as government-backed troops shelled the front lines of rebels trying to advance into government-held territory. Mogadishu’s mayor warned residents to flee the fighting, which is expected to intensify in coming weeks after the government launches a long-awaited offensive against Islamist insurgents. Emergency officials say at least 50 people have been killed and nearly 150 wounded in fighting in the Somali capital on Wednesday and Thursday. At least two more people were killed in fighting Friday, a resident reported. At least six were wounded, emergency officials said. Rebels advanced to as close as 1 mile (2 kilometers) from the government-held area on Thursday, but have since been pushed back several blocks. Mogadishu Mayor Abdurisaq Mohamed Nor told citizens to move at least a couple miles (kilometers) away from battle zones. Residents in Mogadishu are often caught in crossfire or are hit by off-target munitions. A resident, Mohamed Abdi Haji, said that about 200 insurgents aboard a dozen gun-mounted vehicles moved into his neighborhood and drove toward the presidential palace. Government soldiers and African Union peacekeepers fired barrages at the militants and forced them to retreat, Haji said. In May the European Union, whose membership largely overlaps with that of NATO and which is engaged in intense integration with the military bloc on a global scale , will begin training 2,000 Somali troops in Uganda. 600s – Arab tribes establish the sultanate of Adel on the Gulf of Aden coast. 1500s – Sultanate of Adel disintegrates into small states. 1875 – Egypt occupies towns on Somali coast and parts of the interior. 1860s – France acquires foothold on the Somali coast, later to become Djibouti. 1887 – Britain proclaims protectorate over Somaliland. 1888 – Anglo-French agreement defines boundary between Somali possessions of the two countries. 1889 – Italy sets up a protectorate in central Somalia, later consolidated with territory in the south ceded by the sultan of Zanzibar. 1925 – Territory east of the Jubba river detached from Kenya to become the westernmost part of the Italian protectorate. 1936 – Italian Somaliland combined with Somali-speaking parts of Ethiopia to form a province of Italian East Africa. 1940 – Italians occupy British Somaliland. 1941 – British occupy Italian Somalia. 1950 – Italian Somaliland becomes a UN trust territory under Italian control. 1956 – Italian Somaliland renamed Somalia and granted internal autonomy. 1960 – British and Italian parts of Somalia become independent, merge and form the United Republic of Somalia; Aden Abdullah Osman Daar elected president. 1963 – Border dispute with Kenya; diplomatic relations with Britain broken until 1968. 1964 – Border dispute with Ethiopia erupts into hostilities. 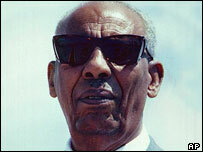 1967 – Abdi Rashid Ali Shermarke beats Aden Abdullah Osman Daar in elections for president. 1969 – Muhammad Siad Barre assumes power in coup after Shermarke is assassinated. 1970 – Barre declares Somalia a socialist state and nationalises most of the economy. 1974 – Somalia joins the Arab League. 1974-75 – Severe drought causes widespread starvation. 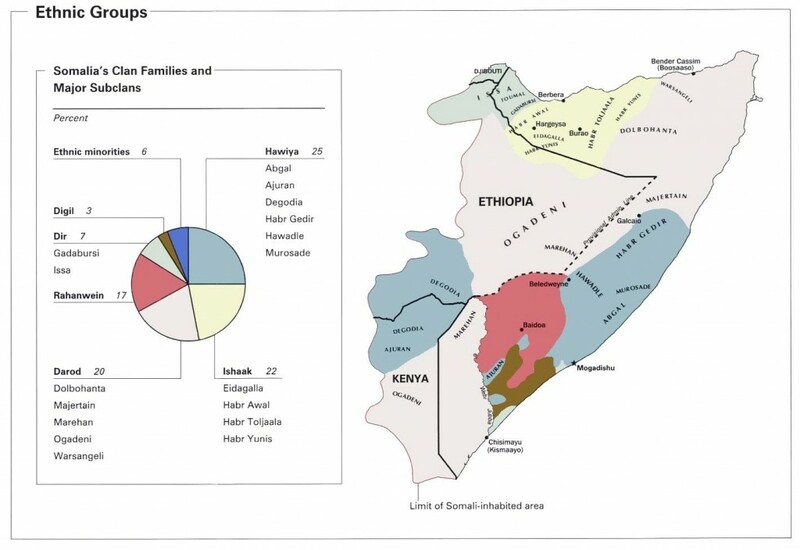 1977 – Somalia invades the Somali-inhabited Ogaden region of Ethiopia. 1978 – Somali forces pushed out of Ogaden with the help of Soviet advisers and Cuban troops. Barre expels Soviet advisers and gains support of United States. 1981 – Opposition to Barre’s regime begins to emerge after he excludes members of the Mijertyn and Isaq clans from government positions, which are filled with people from his own Marehan clan. 1988 – Peace accord with Ethiopia. 1991 – Mohamed Siad Barre is ousted. Power struggle between clan warlords Mohamed Farah Aideed and Ali Mahdi Mohamed kills or wounds thousands of civilians. 1991 – Former British protectorate of Somaliland declares unilateral independence. 1992 – US Marines land near Mogadishu ahead of a UN peacekeeping force sent to restore order and safeguard relief supplies. 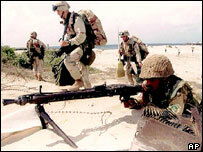 1993 – US Army Rangers are killed when Somali militias shoot down two US helicopters in Mogadishu and a battle ensues. Hundreds of Somalis die in the battle depicted in the film “Black Hawk Down”. US mission formally ends in March 1994. 1995 – UN peacekeepers leave, having failed to achieve their mission. 1996 – Warlord Muhammad Aideed dies of his wounds and is succeeded by his son, Hussein. 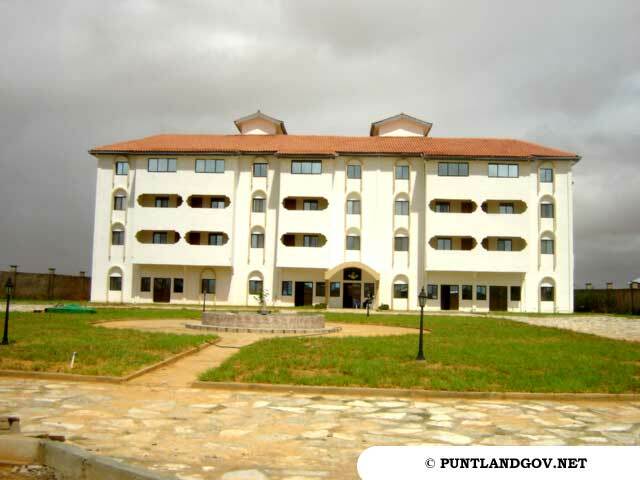 1998 – Puntland region declares autonomy. 2000 August – Clan leaders and senior figures meeting in Djibouti elect Abdulkassim Salat Hassan president of Somalia. 2000 October – Hassan and his newly-appointed prime minister, Ali Khalif Gelayadh, arrive in Mogadishu to heroes’ welcomes. Gelayadh announces his government, the first in the country since 1991. 2001 April – Somali warlords, backed by Ethiopia, announce their intention to form a national government within six months, in direct opposition to the country’s transitional administration. 2001 August – UN appeals for food aid for half a million people in the drought-hit south. 2004 August – In 14th attempt since 1991 to restore central government, a new transitional parliament inaugurated at ceremony in Kenya. In October the body elects Abdullahi Yusuf as president. 2004 December – Tsunami waves generated by an undersea earthquake off Indonesia hit the Somali coast and the island of Hafun. Hundreds of deaths are reported; tens of thousands of people are displaced. 2005 February – June – Somali government begins returning home from exile in Kenya, but there are bitter divisons over where in Somalia the new parliament should sit. 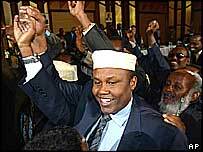 2005 November – Prime Minister Ali Mohammed Ghedi survives an assassination attempt in Mogadishu. Gunmen attack his convoy, killing six people. 2006 February – Transitional parliament meets in Somalia – in the central town of Baidoa – for the first time since it was formed in Kenya in 2004. 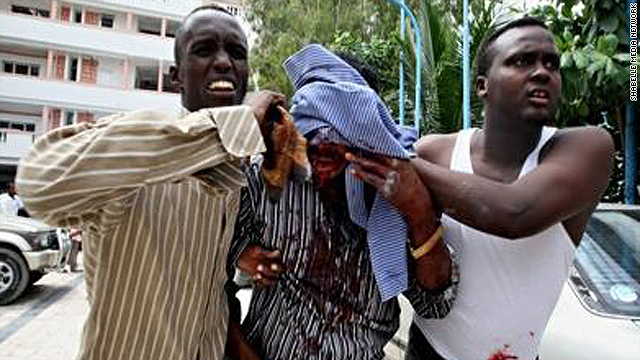 2006 March and May – Scores of people are killed and hundreds are injured during fierce fighting between rival militias in Mogadishu. It is the worst violence in almost a decade. 2006 June-July – Militias loyal to the Union of Islamic Courts take control of Mogadishu and other parts of the south after defeating clan warlords. Ethiopian troops reported in Somalia. 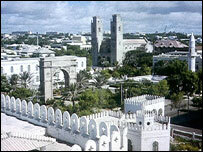 2006 July-August – Mogadishu’s air and seaports are re-opened for the first time since 1995. 2006 September – Transitional government and the Union of Islamic Courts begin peace talks in the Sudanese capital, Khartoum. Somalia’s first known suicide bombing targets President Yusuf outside parliament in Baidoa. 2006 October – About 35,000 Somalis escaping drought, strict Islamist rule and the possibility of war have fled to Kenya refugee since the start of 2006, the UN reports. War of words between Ethiopia and Somalia’s Islamists. Premier Meles says Ethiopia is “technically” at war with the Islamists because they had declared jihad on his country. 2006 December – UN Security Council resolution endorses African peacekeepers, specifies that neighbouring states should not deploy troops. Islamist leaders react by saying they will tackle foreign forces as invaders. Ethiopian and transitional government engage the Islamists in battle and soon put them to flight. 2006 December 27 – African Union, Arab League urge Ethiopia to pull out its troops. UN Security Council fails to agree on a statement calling on foreign forces to withdraw. 2006 December 28 – Joint Ethiopian and Somali government force captures Mogadishu. 2007 January – Islamists abandon their last stronghold, the port town of Kismayo. President Abdullahi Yusuf enters Mogadishu for the first time since taking office in 2004. US carries out air strikes in southern Somalia which it says targetted al-Qaeda figures, and which reportedly kill an unknown number of civilians. It is the first known direct US military intervention in Somalia since 1993. The strikes are defended by President Yusuf. They are condemned for killing innocent civilians. Interim government imposes three-month state of emergency. 2007 February – UN Security Council authorises a six-month African Union peacekeeping mission for Somalia. 2007 March – African Union peacekeepers land at Mogadishu amid pitched battles between insurgents and government forces backed by Ethiopian troops. The Red Cross says it is the worst fighting in 15 years. 2007 April – UN says more than 320,000 Somalis have fled fighting in Mogadishu since February. Hundreds of people are reported killed after several days of fierce clashes in the capital. 2007 May – The World Food Programme says a resurgence of piracy is threatening food supplies. 2007 June – A US warship shells suspected Al-Qaeda targets in Puntland. 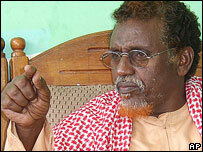 Prime Minister Ghedi escapes a suicide car bomb attack on his compound. Ethiopian Premier Meles Zenawi visits Mogadishu, pledging to withdraw his troops once peace takes hold. 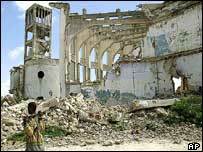 2007 July – National reconciliation conference opens in Mogadishu and comes under mortar attack. Islamist leaders stay away from the talks. Refugee exodus grows amid an upsurge in violence. 2007 August – Human Rights Watch accuses Ethiopian, Somali and insurgent forces of war crimes, and the UN Security Council of indifference during the recent conflict. 2007 September – Opposition groups form a new alliance to campaign for a military and diplomatic solution to the Somali conflict. They meet in Asmara, Eritrea. 2007 October – Ethiopian forces fire on demonstrators in Mogadishu protesting at the presence of what they call foreign invaders. Heaviest fighting in Mogadishu reported since April. Ethiopians move reinforcements into the city. Aid agencies warn a catastrophe is unfolding in Somalia. 2007 November – Government shuts down Radio Shabelle, Radio Simba and Radio Banadir. UN special envoy Ahmedou Ould-Abdallah describes Somalia’s humanitarian crisis the worst in Africa, suggests using international justice to curb the violence. Nur Hassan Hussein, also known as Nur Adde, sworn in as new prime minister. Number of Somali refugees hits one million, with nearly 200,000 fleeing the capital in the past two weeks, the UN reports. 2007 December – Ethiopian troops leave key central town of Guriel. 2008 January – Burundi becomes the second nation to contribute troops to the African Union peacekeeping force, sending 440 soldiers to Mogadishu. 2008 March – US launches missile strike on southern town of Dhoble targeting suspected al-Qaeda member wanted for 2002 bombing of Israeli-owned hotel in Kenya. Islamist-led insurgency continues to spread. 2008 April – EU calls for international efforts to tackle piracy off the Somali coast after a series of hijackings and attacks on vessels. 2008 April – US air strike kills Aden Hashi Ayro, a leader of the Al-Shabab insurgent group. 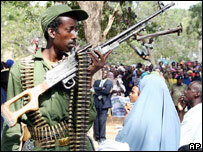 2008 May – Ethiopian Prime Minister Meles Zenawi says he will keep troops inside Somalia until “jihadists” are defeated. The UN Security Council unanimously votes to allow countries to send warships into Somalia’s territorial waters to tackle pirates. 2008 June – Government signs three-month ceasefire pact with opposition Alliance for Re-Liberation of Somalia. The deal, which provides for Ethiopian troops to leave Somalia within 120 days, is rejected by Islamist leader Hassan Dahir Aweys, who says Union of Islamic Courts will not stop fighting until all foreign troops have left country. 2008 July – Head of the UN Development Programme in Somalia, Osman Ali Ahmed, killed by gunmen in Mogadishu. 2008 September – Somali pirates’ hijacking of a Ukrainian ship carrying 33 tanks prompts widespread international concern. The US and other countries deploy navy ships to Somali waters. 2008 October – Nato agrees to despatch a naval force to patrol to waters off Somalia by the end of 2008, in an effort to control piracy. A wave of coordinated bombings across the self-governing and relatively peaceful regions of Somaliland and Puntland, in Somalia’s north, kill at least 27 people. 2008 November – Somali pirates hijack an oil-laden Saudi super-tanker and demand a 25m dollar ransom for its return. 2008 December – Ethiopia announces plans to withdraw all forces by end of 2008. President Abdullahi Yusuf tries to sack Prime Minister Nur Hassan Hussein over his attempts to draw moderate Islamists into the government. Parliament declares the dismissal unconstitutional and passes a vote of confidence in Mr Nur. Mr Yusuf resigns. 2009 January – Ethiopia completes the withdrawal of its troops. Fighters from the radical Islamist al-Shabab militia take control of the town of Baidoa, formerly a key stronghold of the transitional government. Meeting in neighbouring Djibouti, Somalia’s parliament swears in 149 new members from the main opposition Alliance for the Re-Liberation of Somalia. It elects a moderate Islamist, Sheikh Sharif Sheikh Ahmed, president, and extends the transitional government’s mandate for another two years. 2009 February – President Ahmed selects Omar Abdirashid Ali Sharmarke as prime minister. Mr Sharmarke, a former diplomat, is widely seen as a bridge between Islamists within the Somali government and the international community. 2009 May – Islamist insurgents launch onslaught on Mogadishu. 2009 June – Somalia’s security minister and more than 20 other people are killed in a suicide bombing at a hotel in Beledweyne, north of the capital Mogadishu. President Ahmed declares a state of emergency as violence intensifies. Somali officials appeal to neighbouring countries to send troops to Somalia, as government forces continue to battle Islamist insurgents. 2009 September – Al-Shabab proclaims allegiance to Al-Qaeda leader Osama Bin Laden. 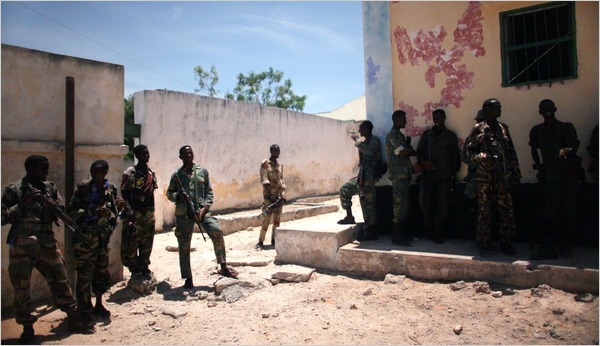 2009 October – Al-Shabab wins control over the southern port city of Kismayo after defeating the rival Hizbul-Islam Islamist militia, which withdraws to villages to the west. 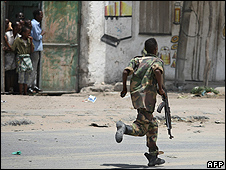 At least 20 are killed and 70 injured in fighting that threatens to spread to the rest of the Islamist-controlled south. 2009 November – Pirates seize a supertanker carrying oil from Saudi Arabia to the US, one of the largest ships captured off Somalia. The Greek-owned Maran Centaurus was about 1,300km (800 miles) off Somalia when it was hijacked. Kidnappers released journalists Amanda Lindhout and Nigel Brennan after 15 months in captivity. 2009 December – Al-Shabab denies being behind suicide attack that killed 22 people in Mogadishu, including three ministers. 2010 January – Al-Shabab declares it is ready to send fighters to support Islamist rebels in Yemen. 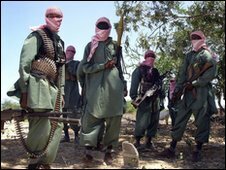 2010 February – Al-Shabab formally declares alliance with al-Qaeda, begins to concentrate troops in southern Mogadishu for a major offensive to capture the capital. An Associated Press reporter in Mogadishu said the fighting is the heaviest since last May, when insurgents trying to topple the weak, U.N.-backed government launched massive attacks. Residents fleeing the city said many of their relatives and neighbors are trapped in the war zone. “My husband and six of my relatives and some of my neighbors are trapped inside their homes … by mortars and bullets flying every where,” said Dahabo Duhulow, a mother of six. An Associated Press photo showed red couches piled high on a wooden, donkey-pulled cart as two Somalis helped propel the cart forward. With his 2-year-old son clasped to his chest, Adow Yusuf Da’ud said that he had walked three hours through dangerous streets to escape the fighting. More than half of those living in Somalia’s seaside capital have fled. Those remaining are mostly too poor to move or fear being attacked as they leave. Compounding their dilemma, an Islamist group issued a series of demands at the beginning of the year that caused the U.N.’s World Food Program to pull out of much of southern Somalia. Soon families fleeing into the countryside may find nothing to eat. Neither the Islamists or the U.N.-backed government can take and hold enough ground for a decisive victory. The government is supported by around 5,300 African Union peacekeepers, whose tanks and armored vehicles help them to outgun the insurgents. The insurgents favor mobile hit-and-run attacks, using snipers and mortar fire to make it hard for the government’s poorly trained and irregularly paid soldiers to hold their position. The government hopes to break the stalemate with an upcoming offensive, but its launch has been delayed by problems that include inadequate equipment and training. There has been a surge in fighting since the beginning of the year, when the offensive was first being publicly discussed. Even if the government push succeeds, few Somalis trust an administration that has failed to deliver even a semblance of services or security more than a year after it took power. The arid Horn of Africa nation has not had a functioning government since the overthrow of a socialist dictator in 1991. Its civil war, which began into clan warfare, has morphed in recent years into a fight between an administration favored by the international community and an Islamist insurgency backed by hundreds of newly arrived foreign fighters. Somalian Syndrome V :- Famined, Damned & Hopeless of the Horn transformed themselves to Bagdadi type suicide bomb :- The Horn of Africa Dictators in High Alert !!! The Islamist group which controls much of southern Somalia has rejected accusations that it was behind the car bomb on the government base, Baidoa. Union of Islamic Courts (UIC) leader Sheik Hassan Dahir Aweys has condemned the attack, in which at least nine people died. Government officials have accused the UIC of organising Thursday’s blast. There are fears of widespread conflict between the government and the UIC and their regional allies. The government says they have arrested three more suspects following raids in houses and hotels in Baidoa, after three people were arrested on Thursday. A government source says one of those arrested lost a leg in the explosion and another is a woman. Police have tightened security around the town and several cars from the Islamist-held capital, Mogadishu, were not allowed to enter Baidoa. A policeman told the BBC that a female suicide bomber wearing a veil blew herself up at a check-point on the outskirts of the only town under government control. “There were flames everywhere,” an eye-witness said. Two of those killed were police officers. The government says it was a suicide bombing but there is no independent verification of this. “All indications are that they were trying to bring the explosives into Baidoa and their motive could be killing government officials, but we expect to get a clearer picture from the interrogation,” Information Minister Ali Jama told the AFP news agency. Some officials have suggested that the attackers were foreign members of the al-Qaeda network. But Mr Aweys denied the charges. “This is a baseless allegation. They have no evidence to say the Islamic courts are behind this,” he told the AP news agency. Interim President Abdullahi Yusuf survived a suicide car bomb attack in Baidoa two months ago, which killed his brother. He said they were foreign members of al-Qaeda. The UIC denies links to al-Qaeda but is opposed to the government and has threatened to launch a holy war to drive Ethiopian troops out of the country. Ethiopia admits it has hundreds of military trainers helping the government but denies they are taking part in any conflict. The Ethiopian parliament on Thursday passed a resolution authorising the government to take all necessary and legal steps against any invasion by UIC. The resolution said there was a clear and present danger to Ethiopia from the UIC. Ethiopia’s rival Eritrea denies claims that it backs the UIC. At least 19 people have been killed including three government ministers after an explosion ripped through the Shamo Hotel in Mogadishu, the Somali capital, during a graduation ceremony. A suicide bomber disguised as a woman carried out Thursday’s attack at the hotel during a crowded graduation ceremony for medical students from a local university, Dahir Mohamud Gelle, the Somali information minister, said. Witnesses said the attack appeared to have targeted government officials. It is the deadliest attack to hit Mogadishu for several months. No-one has yet claimed responsibility. Of the three ministers killed in the blast, one was a woman – Qamar Aden Ali, the health minister. Ibrahim Hassan Adow, the minister for higher education, and Ahmed Abdullahi Wayel, the minister for education, also died. Also among the dead were two journalists and two professors. At least 50 students were reportedly injured. Saleban Olad Roble, the Somali sports minister, was also injured in the explosion. Thursday’s attack is the second time this year members of government have been killed in a suicide bombing. In June, the national security minister died in a suicide bombing that killed at least 24 people. Al-Shabab claimed responsibility for that attack. Al Jazeera’s Nicole Johnston’s reports. MOGADISHU, Somalia — A suicide bomber disguised as a woman attacked a graduation ceremony in Somalia on Thursday, turning a rare reason to celebrate into carnage that killed at least 22 people – including medical students, doctors and three government ministers. The blast was blamed on Islamic militants who have shown a rising ability to carry out sophisticated large-scale bombings against high-profile targets – and highlighted the inability of Somalia’s weak government to protect even the small section of the capital it controls. Several hundred people had gathered in the Shamo Hotel to watch the 43 medical, engineering and computer science students from Benadir University receive their diplomas when the blast ripped through the festively decorated ballroom. Amateur video of the attack obtained by AP Television News showed the dead, including at least three journalists, lying in pools of blood amid the sound of wails and screams from the wounded. Soldiers, their AK-47 rifles slung over their shoulders, picked through the wreckage with their hands as survivors climbed over the debris of the bombed-out room. The attack targeted one of Somalia’s most important efforts to extricate itself from anarchy and violence, explaining the presence of so many top government officials. The graduating medical students were only the second class to receive diplomas from the medical school. “The loss of our ministers is disastrous, but it is an outrage to target the graduation of medical students and kill those whose only aim in life was to help those most in need in our stricken country,” Somali Prime Minister Omar Sharmarke said. Before last year’s graduation, almost two decades had passed since anyone earned a medical degree in Somalia. At the December 2008 ceremony, graduates proudly hoisted their diplomas into the air. ——–(CNN) — A male suicide bomber dressed in women’s clothing killed three members of Somalia’s U.N.-backed interim government and 16 others Thursday when he detonated at a medical school graduation ceremony in Mogadishu, government officials and witnesses said. The Transitional Federal Government said Education Minister Abdullahi Wayel, Health Minister Qamar Aden and Higher Education Minister Ibrahim Hassan Adow were among the dead after the bomber attacked Banadir University’s medical school commencement. The African Union, which leads a peacekeeping mission in Somalia, put the death toll at 19. The victims also included nine students and two doctors, according to a professor at Banadir University, while journalists said two of their colleagues died in the blast. In addition, Sports Minister Suleman Olad Roble was hospitalized in critical condition, his relatives told local media. Somali President Sheikh Sharif Sheikh Ahmed blamed the Islamist rebel group Al-Shabaab for the attack and displayed what he said was the body of the bomber for reporters, a local journalist who attended the news conference told CNN. The body the president displayed had a beard. The president also showed the remains of the suicide belt and shreds of a hijab — a garment worn by some Muslim women to reflect modesty — at the news conference, according to the journalist, whom CNN is not naming for security reasons. “The Security Council expresses its deepest sympathies and condolences to the families of those killed and to those injured in the attack, as well as to the Transitional Federal Government and the people of Somalia,” the council’s current president, Burkina Faso’s U.N. Ambassador Michel Kafando, said Thursday. Video of the graduation ceremony showed Dr. Osman Dufle, the country’s former health minister, speaking as the camera begins to shake — apparently from the explosion. Afterward, Dufle told journalists that he saw a person dressed in black moving through the audience just before the blast, according to the Radio Mogadishu journalist. Al-Shabaab is made up of former allies of Ahmed, once a leader of the Islamist movement that briefly held power in Mogadishu in 2006. Adow, a Somali-American, served as the foreign secretary of the Islamic Courts Union when it held Mogadishu. But while Ahmed and other former members of the ICU accepted a U.N.-brokered peace agreement with the government they once fought, Al-Shabaab — which the United States says has links to al Qaeda — has rejected the peace agreement and has waged a bloody campaign against the transitional government. The African Union’s peacekeeping mission AMISOM condemned Thursday’s attack. It vowed to “spare no efforts to ensure that the perpetrators of this act and such heinous crimes against humanity being carried out in Somalia” will be brought to justice. The journalists killed were Mohamed Amiin Abdullah of Shabelle Media Network and freelance cameraman Hassan Ahmed Hagi, who worked closely with the network. CNN regularly works with Shabelle Media. The African Union condemned the attack, saying it would “spare no efforts to ensure that perpetrators of this act and such heinous crimes against humanity being carried out in Somalia” will be brought to justice. The National Union of Somali Journalists also condemned the attack and said it brought the number of journalists killed in the country this year to eight. HOBYO, Somalia, Oct. 23 (UPI) — The European Union anti-piracy force says the hijacked Chinese bulk carrier De Xin Hai has arrived off the coast of Somalia. EU NAVFOR said Thursday on its Web site a EU NAVFOR Maritime Patrol Aircraft confirmed the De Xin Hai was spotted near the Somalia harbor city of Hobyo. “It is not yet known if the pirates have contacted the owners and made their demands known,” the anti-piracy force said. China’s official state-run Xinhua news agency reported the Chinese vessel, which has 25 crew members, was hijacked in the Indian Ocean Monday. The carrier belongs to Qingdao Ocean Shipping Co. and was shipping coal from South Africa to India when commandeered. Xinhua said China is one of a dozen countries that sends naval ships to the Gulf of Aden region to protect maritime shippers from pirates.